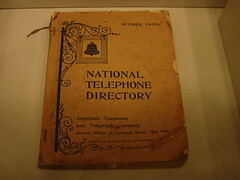 These days telephone books and other specialized directories have nearly become obsolete. Like most people probably do, when I want to find a business or information about somebody or something, I will typically do an internet search. Most information provided by directories can be found on-line, plus we have the added ability of cross-referencing information in multiple sources. If you are in business or trying to market something, this is why you need a web presence. If you're reading this, it probably indicates that you already have some web presence. Odds are you have a blog and that's one step in establishing your place in cyberspace. You are also probably signed up on one or more social media sites such as Facebook, Twitter, or LinkedIn. The more places on the web that you can be found, the more significant your web presence is. I am of course stating the obvious to most of you. My blog entry today is not going to be any extensive how-to on the subject of search engine optimization or building a website or anything of this nature. And since I am no expert on these types of topics I can only allude to them and recommend that you do your own research in the many books, blogs, and websites that are dedicated to these topics. Tied in with physical visibility is the virtual visibility provided by the internet. The platform that concerns most of us is our blog. Once you have a blog established it is important to infuse quality content into it, especially if you are intending it to be a professional showcase of who you are and the abilities you possess. A blog can be a great marketing tool as much as it can be the stage for a fool. Hopefully you are not putting yourself in the latter category unless buffoonery is the persona you are trying to sell. Blogging web presence is not just limited to your blog. Realize that your comments on other blogs are also part of that presence. Quality comments can get noticed in a good way. A caveat which I know well is that an inappropriate comment can linger as well and bite you in the behind when you least expect it. Be careful what you say. Another very important aspect to blogging presence is being recognized on the blogs of others. Make friends in the community of other bloggers. Give credit to what other bloggers are doing and showcase them on your blog. Host guest bloggers if you can. And whenever possible be a guest on other blogs if you are invited to do so. Maximum exposure without overexposure is the name of the game in blogging. So with that opening let me extend my invitation. After the April Challenge it's business back to normal on my blogs. I will be looking for the occasional guests on Tossing It Out who have books released or something of particular interest to my audience. On Wrote By Rote I frequently feature those who have memoirs in print or who have something of special interest to those who are interested in the topic of memoir writing. If you have something that might fit well on my dream blog I'll even consider a guest now and then on A Faraway View. We will also be looking for a lot of guest posts at the Blogging from A to Z April Challenge Blog during the course of the rest of the year--contact us or watch that blog for more details. If you are interested in doing guest posts for any of these, please contact me at arleebird@gmail.com. Teresa at Journaling Woman has long been a blog friend of mine. If you haven't visited her A to Z entries you must experience the unique treats she has to offer. She's been working very hard on her stories. Karen Walker is another blogger whom I have followed since my earliest blogging days and will provide some food for thought when you visit her blog Author Karen Walker...following the whispers. Larry Cavanaugh at DiscConnected could not join us for this year's Challenge but he's given much input into my site both on the page and behind the scenes. Music lovers will especially appreciate his site. Marcus Clearspring has not actually been posting in this year's Challenge, but he's made an important contribution. You know those A to Z Navigation Buttons that so many of you have added to your pages? Well, Marcus is the guy that created those for you to use. Please stop by to say hello and thank him. What are some ways you have left digital footprints? Do you host guests on your blog? Do you make guest appearances on other blogs? Extremely informative article as always Lee, there's nothing more important when it comes to blogging than building up a stringent, reliable web presence to fall back upon. I mean simply by posting comments we're putting ourselves into the view of so many people searching the web so the more we do and the more extensive we are the better. I would really like to know how people feel about guest posts. I've read comments that stated that those were typically posts people ignored. If it's actually something people enjoy, I would think about having a few people provide a guest post on my blog. I've finally found out how to access my dashboard, things were fine until blogger mixed things up a bit. It's all a learning curve I suppose. On the topic of web presence, I tried to keep away from the Internet for years. I felt that my life was my business and didn't want it to become public knowledge. Was I in for a surprise. One day, out of curiosity, I Google'd my name and got the shock of a lifetime, there were pages and pages of Geoff Maritz. It all has something to do with being in the Movie industry, I've had a web presence since 1990. Who would have thunk of such a thing? Anyway, from then on it was no longer an option to remain anonymous, I opened a Facebook account, I've closed it since because of the trashy language being used, I also started Blogging and the rest is history. It has been my experience that sensitivity is needed in commenting on other peoples posts as well as in my own writing. Another thing I've found is people from all walks of life come to and read my blog, not just bloggers. I've had people I know come up to me and say, "I read your blog, all of it." This has always surprised me and left me a little humbled. I personally haven't featured any other writers on my blog but have been thinking about it for some time now. Bless you my friend and, once again, thanks for what your A to Z April challenge has taught me with regard to my blogging, Geoff. I have a regular interview with fellow kidlit authors on my blog called Memories of High School You. It's been a great way to meet other writers and bloggers. I wrote a guest poem on your dream blog when it first started. Hey, Lee, thanks for the shout out - I really appreciate it. As for web presence, it is a crucial part of a marketing plan for an author if they have a book to sell or are planning to publish a book at some point. And you are so right about being careful about what you say. I miss the phone book, it helped me sit higher in the chair. It's sad I just visited someone who mentioned white out, another item hit by the damn paperless society. Great post, I went on a tangent..
Great advise and hmmm? Phone books. The best thing about them was, I never spent hours looking at them like I do the Internet. I still use the phone book! >.< But I understand what you're saying. Web presence is VERY important. Guest blogging is fun and it's a great way to branch out and get the attention of another audience that you may have been missing out on. Great info on blogging! Phone books aren't what they used to be...and what do we do when the power goes out? Which it does where I live....high winds, tall trees, steep hills. Thank you for your nice words and the informative blog. I will try to remember my Twitter password...I started one before they became popular but never used it. Yeamie -- You are correct, Matthew. Nellie -- You have a point. I think there are several factors, the main ones being who the guest is, the usual traffic on the blog, and the subject matter. Often my guest post do attract few comments, but others have had huge responses. There is entire post that could be devoted to your question. Geoff-- It can be surprising to find out some of the people who read our blogs, especially when it's the result of an internet search. I've had some unique inquiries and responses from people who found one of my posts as a result of an internet search. Julie -- A speaking tour could be nice, but I guess a book and more web presence would have to come first. Jaye -- I think a regular series could work well if it were expected by readers. Yvonne -- You seemed like a good choice to be a guest on my dream blog and you did well. Karen -- You've gotten your name and book around on the internet. Yes, I know I've said a few things in comments I probably shouldn't have said, but then again my remarks reflected things I felt. Jeremy -- Yeah, I've got a whole multi-pack of white out that's probably dried up by now. Go paperless, save trees--at least that's what they claim. Em - You never sat around reading the phone book? I used to do it a lot--seriously, I really did. Sheenah-- I use the phone book every now and then and these days there are more phone books than ever--I have a stack of them. You're right about expanding the audience. I like to find guests who are somewhat out of the realm of my typical audience interests. Those posts often result in lower comments, but I think they are often more interesting to me at least and hopefully to a few others. Soggy -- There doesn't seem to be as much in the phone books as there used to be. I think a lot of advertisers are no longer listed there. The power issue can be a real problem to those depending on internet. A good time to read by candlelight perhaps? Or talk to each other? Madeleine - I've been surprised by the comments I've found in internet searches--comments that were both mine and those of others. Alex -- You've turned web presence into an art. You've stated this so well, Lee! Yes, we just throw our phone books into the recycling bag now, though I'm still hooked on calling 411 for phone # info. I'm always aware that I need to conduct myself in a respectful way on the web. Your offer of reaching out to folks to guest post is generous. I don't have anything remotely relatable to memoir however. I'll keep thinking about it, and check those bloggers you listed. Just make sure that if you guest-blog you get the recognition you should! I wrote one for a site (which shall remain linkless...) and even after pestering them four or five times they did not link back to my blog anywhere on it. So it's got my name and a nice picture, but no link back. Boo. I'm a new blogger, and am delighted to have found your information. I'm eager to put it into action. I write ArmsWideOpen, a motivational/inspirational/fitness blog aimed at helping people achieve their goals and dreams, whatever they may be. Thanks for the advice. I think it can be boiled down to this: be nice and participate. Be active on other blogs, be supportive of other writers, form relationships. Not all of us have huge writing communities in our own neighborhoods, so the internet provides a way for us to have that community, and doing what you're saying helps us take the most advantage of it. All great points Lee. I visited 30 blogs on the list yesterday commenting and following everyone. I got one follower back and a couple of comments. When someone makes a comment on my blog or follow me I always return the favor. I think it's bad manners if you don't at least follow and or comment. I mean how much time does it take? And it is a Social thing. Web presence is something I am thrilled I made an effort to carry out. Blog tours are a great way to leave footprints. We've hosted each other and these Home and Away posts are a great way to reach people. I'm lining up guests for this summer. I love to host people and make new friends. Of course, guests will bring their peeps over to visit too. Nice posting and you know it will sound weird but I still use and depend on my paper phone book too. Ours has handy little guides one for dining out which is great because their menu's are listed. I have a blog, I comment on blogs, I link to other blogs. In addition I have my own business website, I blog for a regional magazine, plus articles I've had published in the print edition of that magazine and a couple of others appear. The ancient history of my former job is out there also. Sometimes, I Google myself and get a little overwhelmed by how much of me is turns up. All this and I still tend to think of myself as a private person. Not so much, I guess. Catherine-- I stopped using 411 when they started charging for it. ayjay --That's missing the purpose of the guest spot. Maybe they didn't know how to do a link? Patsy -- Good luck with your efforts. I'll be checking out your blog. Sarah - You're right. Blogging is just an extensive of our everyday life and gives us greater opportunities to connect with like-minded people. Lynn -- Nothing wrong with recreational blogging. If you're not seeking a platform for something career oriented don't worry about it and have fun. Debra -- I find that sometimes you just have to be obvious and ask for a follow. Especially in something like the A to Z there is so much coming and going it's easy to lose track of who's following whom. Glynis -- Sounds pretty gratifying. Congratulations on your success. Stephen -- You know about what's going on. You've been at it for a while too. Gossip Girl -- I used to use those restaurant guides and menus, but now we don't go out to eat in different restaurants. My wife doesn't like to experiment and she's content to go to a few restaurants she likes. Liza -- Sounds like you've got presence covered. I guess it seems more anonymous revealing things about oneself on the internet. well, hopefully my footprints are nice and deep. Great post. I haven't started guest posting yet, still working up the courage lol. I'd love to guest post on your dream blog and A-Z someday if you'll have me. I'm trying and trying to make prints all over. Time does become a factor. Well , Look-y look-y who the "Surprise" button brought me to. Hi Arlee. I've had a regular movie reviewer as a guest blogger. She's always popular. She has unique views from mine and my audience eats it up. Loads of interesting info here. I've had a number of excellent bloggers do guest posts on my site. And let me inform you of another added dimension that worked extremely well on my site. I have done a two part collaboration posting on my site that received very good feedback and was also a great way to bring further awareness of that blogger. Indeed, positive interaction and making note of other fine bloggers, is an excellent approach. And yes, I have guest posted on other sites. Hello Arlee / Good evening, Just popping by to say hi and thank you again for all your valuable information that you post for us. You always get us thinking, that's for sure. Sonia -- And not tracking in any mud. Anna -- I'll contact you after the Challenge. Susan -- Time can be a cantankerous force. Jemi - Any prints will do as long as somebody follows them to you. Bev -- A movie reviewer is appropriate for your blog. Klahanie-- a collaborative post could be interesting. Moonwynd -- Hope things are moving in the right direction for you. Carla -- You gotta take some steps to make your own presence. Self-promo is part of the business. Hi Lee, I have interviewed a 5-star hotel manager and posted parts of it on my blog, which has become one of my all-time most popular posts! It's good to have important and/or prominent people on your blog! Thank you for visiting my 'W is for White'-post. Hi Lee - great points you and everyone have made .. it's essential to be 'out there', while being true to ourselves and connecting both locally and world wide. Love the links you've given us - I'll probably need to come back anon and meet up with some new friends from here ..
Great info. I need to be more effective at using Facebook and Twitter. Duncan -- Name-dropping is often a big help. Hilary -- We've been getting a lot of links in this Challenge. KM -- I'm still trying to figure out a mastery of Twitter and Facebook. Not enough time for everything. I came across this post while doing some research for one of my clients. Nice post. Happy Wednesday to you!